Now that summer is ALMOST here — which means Dave will be home everyday, we’ll be making a huge mess during our kitchen remodel, and I won’t have my beloved college girl coming to clean every Friday — I’ve decided that my summer cleaning schedule is going to be REALLY relaxed! Once Sarah moves out (in less than 2 weeks) I’ll give the upstairs a really thorough cleaning and then basically try not to use the upstairs rooms for the rest of the summer… which means I won’t have to clean anything up there all summer long! You can see a few pictures of our upstairs in this post. We will also be “partitioning off” our kitchen, dinning room, and the bathroom that’s off the kitchen with heavy construction plastic in hopes of preventing most of that dust from entering the rest of our house. This means that I won’t have to clean that area either. I’m planning to do a quick declutter and cleaning of our basement right after school is out, and then we’ll store most of our kitchen stuff down there during the renovation process… and I’ve already decided that I’m just not going to worry about what the basement looks like until after our kitchen is finished and all the kitchen “stuff” is put back in it’s rightful places again. We’ll be living in about 1/3 (or less) of our home… and I’m super excited about how little time it will take to clean! And since I’ve lived through enough home renovations to know that no matter how hard we try to keep the dust out of the rest of the house, it will still find a way in… so I’m not planning to be super meticulous with my cleaning efforts. I’ll clean our bathroom well each week (see my simple cleaning method here) and I’ll keep the floors as clean as possible (Nora will be crawling soon)… but other than that, I’ll just wait until the renovations are finished and then do some much needed deep cleaning. Even though I definitely wouldn’t want to be “confined” to 1/3 of my house all the time, I think the change of pace will be nice for the summer months — especially since we’ll have plenty of other things to keep us busy! 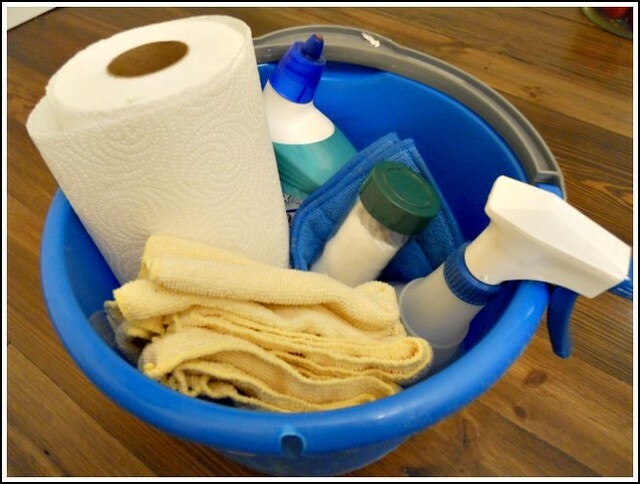 What does your summer cleaning routine look like? Helps maintain good posture, alleviate stress and increase blood flow. Hi, I came across your site when I was looking up ideas for organizing my house. I have kitchen cabinets that are about 2 ft wide and 3 ft deep. For my can Colbert’s I have no idea on how to make it were I can see everything in their. Do you have a idea for them? I would be greatful for help. Wow… what an organized schedule! Sounds like something I should implement once our kitchen renovation project is over!